Hey punks. 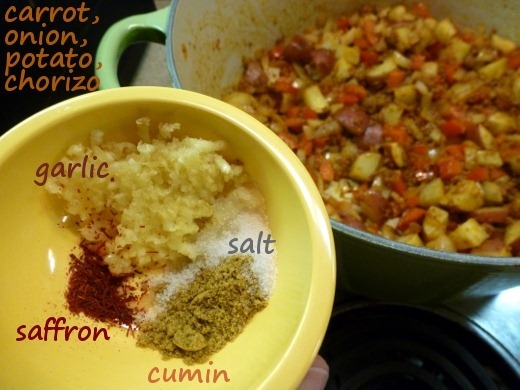 Have you ever cooked with chorizo? I have not.. until this week. 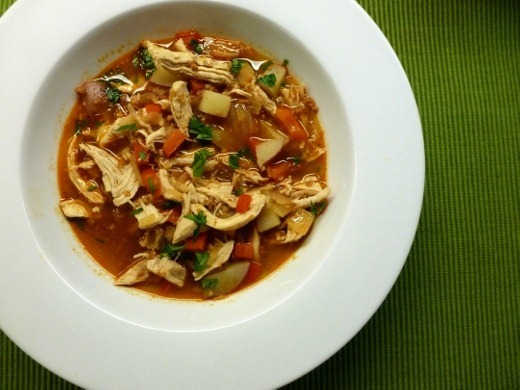 I found this recipe for Chicken & Chorizo Stew in Cooking Light and decided to make it; however, I didn’t realize that I would not be able to find Spanish chorizo at my grocery store. Unfortunately, all I could find was Mexican chorizo, which is a raw, soft, uncured version of the sausage, which is also quite fat-laden. The recipe called for Spanish chorizo, which is a cured, firm version of the sausage, for which I wish that I had searched harder so this recipe would have turned out better. I really wouldn’t recommend making this recipe with Mexican chorizo, as I did, since it didn’t really seem to work out. The ground meat basically ended up disintegrating in the soup, and was quite greasy. Despite that, the Mexican chorizo still added a nice, bold flavor to this stew. Actually, prior to cooking the chorizo, on the weekend I did do some prep work for this recipe, to streamline my weeknight cooking. 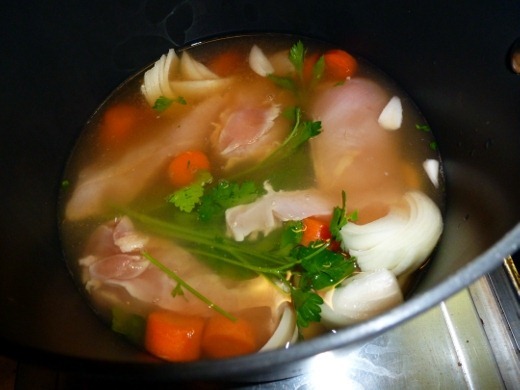 In a pot of chicken broth, carrots, parsley, and onion, I poached chicken breasts. Once they were cooked through and cooled, I shredded them, and stored in the fridge for later usage. 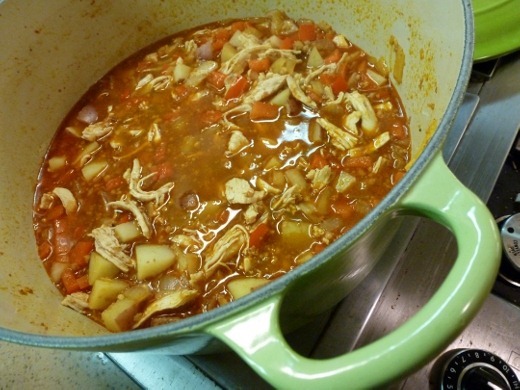 I also discarded the solids from the liquid by running it through a strainer, which left me with a lovely chicken stock, which I stored, and used in this stew on the day of cooking. Once it was stew-cooking-day, after browning the chorizo, I added carrot, onion, and red potato, and sautéed until tender, before adding the below seasonings. This was the second recipe in which I’ve utilized the saffron I received for Christmas! Next, I added in the cooked, shredded chicken, and my homemade chicken stock, and let it simmer for a bit. Sprinkle with parsley, and dinner is served! This Chicken & Chorizo Stew recipe turned out okay. The Mexican chorizo just didn’t work with the recipe though. 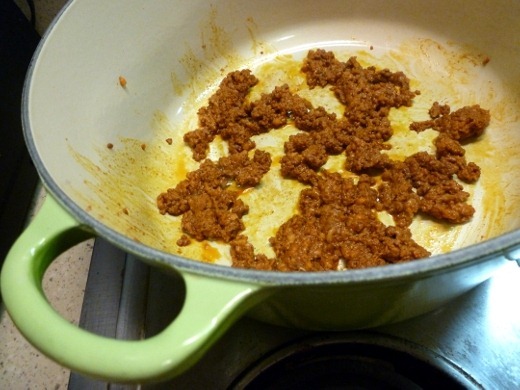 I think it would be much better with the firm, cured, Spanish chorizo, which would make for nice little bite-sized chunks of sausage, rather than tiny, disintegrated bits of ground sausage mixed throughout the soup. All in all, though, the flavor was good, and this made for a nice hearty dinner. Currently listening to: Pardon Me – Incubus. These are the lyrics to this song. A decade ago, I was 15, listened to this song, and never thought I would be 23. Now I’m 25. What the hell happened? ..Pardon me while I burst into flames? How did you crush the saffron so fine? This is the first time I will be using saffron. Pingback: Black Bean and Chorizo Chili « Meg.Goes.Nom.Nom.